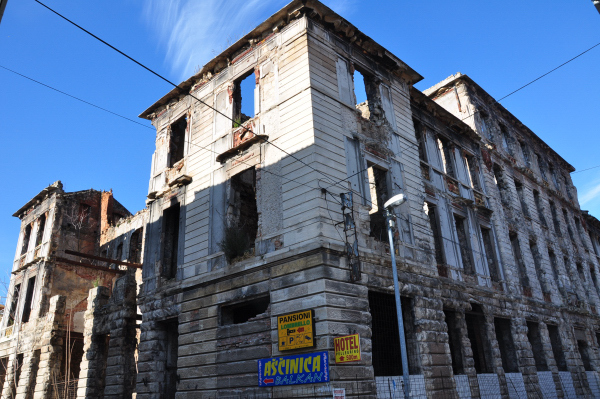 The land between today’s Croatia and Serbia, Bosnia and Herzegovina, was the area that in the conflict of 1993 had the worst bombings and massacres from both Croatians and Serbians. Even today the country is divided in three different parts. In the northwest the Croatian and Catholic part, in the southeast the “Republika Serbska”, the orthodox part and in the centre the Muslim part and from what I saw, the most wounded of all. In the struggle between independence and power, a nation that was once united was split in ethnic parts that almost wiped out each other. That’s how I saw the conflict but I will leave this aside to tell you my travelling story. 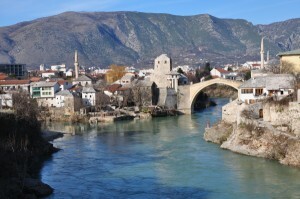 I got into Bosnia and Herzegovina from the Dalmatian coast of Croatia. The country has huge mountains and beautiful gorges with rivers running through them. 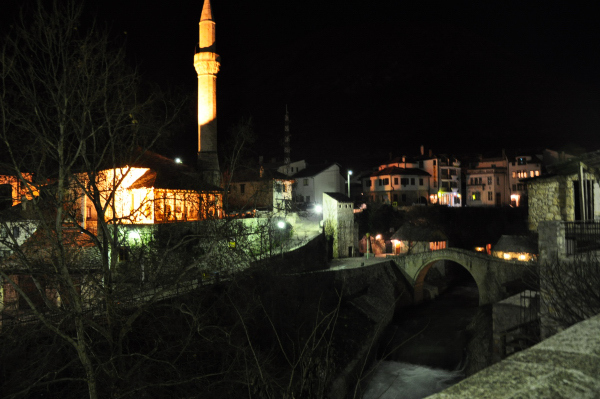 On my way to Mostar, I passed some really picturesque, small villages with extremely hospitable people. I was invited for lunch in somebody’s home when he saw me eating inside Voukefalas since it was too cold to eat outside. The village was so small that it didn’t even have a sign with its name on it. I never asked its name since the young farmer who was my host didn’t speak any English. 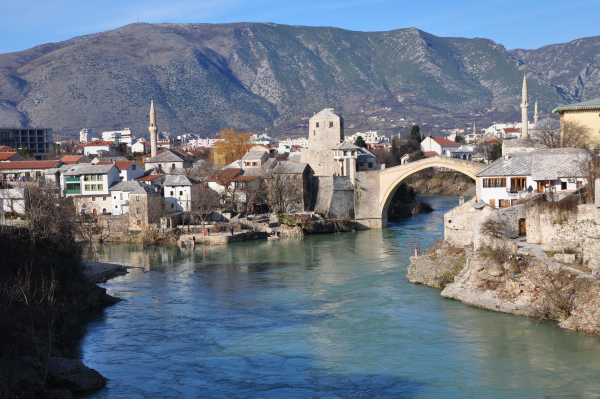 After finishing my poor lunch, next to the comfort of a stove with thick carpets all around it, I had my tea, I thanked him and I headed to Mostar. The city’s landmark in the old Ottoman Quarter is the bridge over the river. 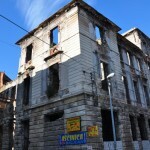 The old one was bombed in one of the attacks of the Serbian air force. The new one, made literally from the same stones collected from the river, is as impressive as the old one. 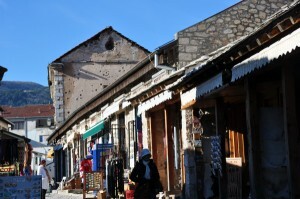 The old quarter, a touristic attraction today, is a wonderful place to wander around. There I met Hector; an Argentinean math teacher that travels around the world like me just to get to know what’s out there. Great guy really. He was extremely impressed by the mosques since there aren’t any in South America. I think he took pictures of every one of them, from every angle. Together we met some girls that told us about the horror they witnessed in 1993. We heard some awful stories from those good looking girls. Yes, I was impressed by how good looking Bosnian girls were. There was a huge cross on the hill above the village. Hector and I climbed up there only to find out later that we should not attempt that again since there were still mines in the area. 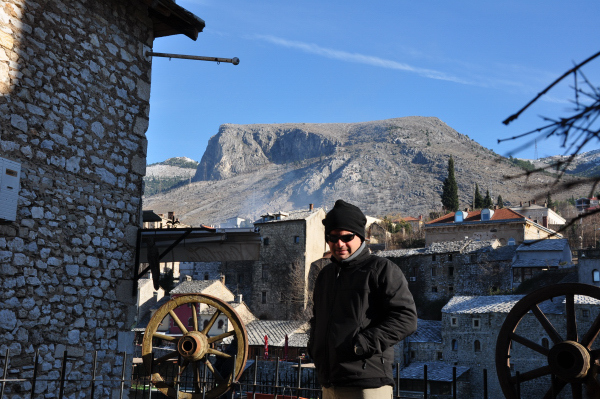 The next day Hector left for the capital Sarajevo, leaving me behind to enjoy Mostar a little more. The following days I spent most of my time with the girls, especially with Axinia. The source of the river and the forest around it were definitely worth the visit despite the cold weather and the snow. I have to mention that except for the war cemetery right in the middle of the city, some buildings are kept as they are, bombed and almost wrecked, as a reminder of the war crimes committed there. After that I crossed the mountains to get to the capital Sarajevo, an astonishing drive through some parts where there’s always snow, even in the summer months. It’s difficult for humans to live in places like these, I suppose, but locals manage to do that. Sarajevo was the centre of the conflict as all three parts were trying to get control of it and although still recovering from that, it looks like a pleasant city. After almost ten years the area still has war remnants and the UN Army is still there to make sure things stay as they are now. In people’s eyes you see that scary look of not knowing what tomorrow will bring. I stayed there long enough to hear many war stories that I wasn’t aware of, since the media back home always present their side of the story. The country is ruled by three different governments that literally hate each other. So it’s difficult for them to make decisions and things run very slowly. However all the sides have understood that they can achieve more when they are united. With the flow of tourism and outside help hopefully things will get better. 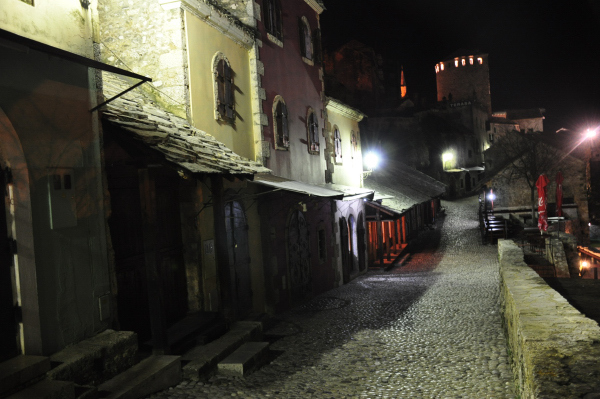 I drove another 300 km around the country before I reached the Serbian border. 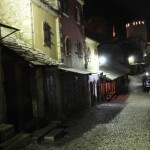 Bosnia and Herzegovina made a great impression to me, although in people’s minds it still is a war zone. The locals were really hospitable and kind and the landscape was great despite all the mountains and the high altitude. 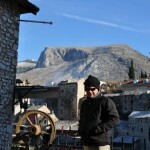 The huge mountain ranges, still untouched by the human hand, dominate most of the area, making the country a winter destination. I could have spent much more time exploring that part of the world but all things must come to an end. So this was the end for me.